Amazon Web Services continues to move forward in innovative ways to get people to take advantage of their services. 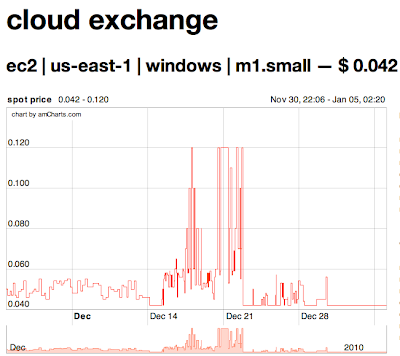 Two announcements last month enhance the EC2 service pricing and the Cloud Front delivery model. The availability of auction price instances (spot instances) in EC2 and the ability to do true Flash streaming from Cloud Front really put the squeeze on traditional hosting and edge delivery companies. With the new Spot Instances in EC2 you can take advantage of the excess capacity that Amazon is not using at that time. Because that capacity changes as more instances are started, the price for those instances fluctuate. With good planning, this can be used to really save on cash. Over the past 20 days, the price of a Spot Instance has been less than 50% of the price of a regular priced instance much of the time. If you are considering using EC2 for some bursting tasks and quick turn around, I would look at the Spot Instances first. Because you set the price you want to pay and the price changes over time, your instance may be terminated if your price is less than the Amazon rate. For this reason, you must plan ahead when using them in a production situation. One good strategy here to lower your costs would be to purchase some Reserved Instances that will stay running and then start Spot Instances in peak situations. You can use the AWS API to see the current prices of the Spot Instances to know how to set your price at runtime. If you want to see the prices online and over time, you can use the AWS console or some other sites like Cloud Exchange. Because you cannot reserve Windows instances right now on Amazon, it makes a lot of sense to take advantage of the Spot Instances. As I write this, a small Windows instance is $0.12 an hour and you can have the same thing running as a Spot Instance for $0.042 an hour. At about 1/3 the price of a standard small instance, it makes it very attractive to use the Spot Instances right now. The announcement of streaming support from Cloud Front is also a great new addition. Delivering content to the end user from the closest data center helps improve performance. Until now, all that could be delivered was static content and progressive downloads. Streaming video from Cloud Front helps reduce your costs because only the viewed parts need to be delivered. It also does not store the file on the end user's machine. You can use Cloud Front to deliver videos in several formats, even H.264 allowing playback on the iPod and iPhone. Thank you Amazon! That was an interesting post on Cloud Computing and its innovations. thanks for sharing it here. By the way I like to share the information about the Cloudslam 2010 conference which is the 2nd annual conference on Cloud Computing which in an upcoming event. They providing such a wonderful opportunity to meet and talk with the world's leading experts. I am very much interested and waiting eagerly to participate in the conference. DreamHost is definitely one of the best hosting company for any hosting services you might need.